Two weekends ago my wonderful cousin Britta got married - the weekend was perfect for many reasons! It was amazing to see Britta and Cody say their vows to each other, to spend the weekend outside and enjoy the season that is fall (even if it was on the chilly-side), and to have the chance to spend time with family and friends. My cousin and his wife, Marie, and son, Sig, stayed a few days longer than the rest of the West Coast family. Selfishly, I couldn't have been more excited! With Alex and Marie I get the best of both worlds. With Alex I get to watch "manly" movies - blood, violence, gore. Boondocks Saints may be our favorite. With Marie, I get to do other things - coffee dates, shopping, things that Alex does not necessarily like doing. The night was an amazing combination of laughter, good food, and great time spent with loved ones. There isn't much more that one could ask for! And to top it all off, I couldn't have asked for a better way to let the stomach settle after a delicious meal than sitting on the ground and playing with this little kid! NEWSFLASH: There are a lot of new and exciting things coming up for SMAK. A lot of it is very much in the development stages. However, there will be big changes as far as the photography. I don't want to spoil the surprise too much... Let's just say that artificial lighting may no longer be a problem! I am excited to see SMAK grow and evolve, hopefully gain followers, but more importantly, be a site that I am proud to call my own. One that you continue to visit. Preheeat the oven to 400° F. Finely chop the needle-shaped leaves from the rosemary. Put the chicken onto a cutting board. Using a small sharp knife, cut a slit into the thickest part of each chicken breast, then pole down inside the chicken to make a pocket. Spoon the cheese into each pocket, using your fingers to help, then seal the pocket up as well as you can. Season the chicken with salt and pepper, then sprinkle with half of the rosemary. 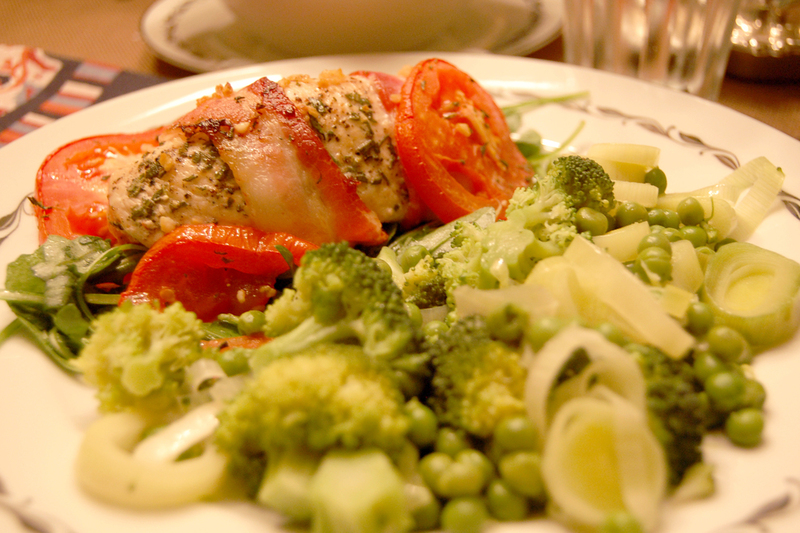 Wrap 2 strips of the bacon tightly around each piece of chicken, tucking in any loose ends. Place a shallow, flameproof casserole over high heat, then add the sunflower or vegetable oil. After 30 seconds, add the chicken. Cook for at least 2 minutes on each side, until the bacon is starting to turn golden. Kitchen tongs are useful here. Meanwhile, very thickly slice the tomatoes and thinly slice the garlic. Add the tomatoes to the casserole, then sprinkle them with the remaining rosemary and the garlic. Season with salt and pepper and drizzle with about 1/2 tablespoon of the olive oil. Put the pan into the oven for 25 minutes. Remove the pan from the oven and set aside for a couple of minutes to let the chicken rest. The chicken will be surrounded with delicious tomato-flavored juices. Put the arugula into a large bowl. Squeeze the juice from the lemon over it and drizzle with the remaining olive oil. Season with salt and pepper. Serve the chicken with the salad, drizzling some of the warm pan juices around each plate. Bring a pan of water to a boil, then season with salt. Meanwhile, pull or chop the broccoli into florets, cutting any larger ones in half. Slice the leeks into rings about 1/4 ince think, and rinse them well. Heat the butter and oil in a frying pan, then add the leeks. Cook for 5 minutes over medium high heat, stirring occasionally, until just softened. Menawhile, put the broccoli into the boiling water. Return to a boil, then cook for 2 minutes. Add the peas, then return to a boil again. The broccoli will be just tender and the peas sweet and bright. Drain well in a colander. Add the peas and broccoli to the frying pan, then toss well with the softened leeks. Season with salt and pepper, then add another pat of butter to serve, if you like. Put a large pan of water over high heat and bring it to a boil. Add the salt, then add the spaghetti and bring back to a boil. Stir once, turn the heat down a little, and boil for 10 minutes, or until the pasta is just tender. While the pasta cooks, start the sauce. Smash the whole garlic clove without peeling it. you can do this by simply bashing it with the bottom of a pan keeping it in one piece. Chop the bacon into small pieces. Heath a large frying pan over medium heat, then add the oil. After 30 seconds, add the chopped bacon and the garlic. Fry for 8-10 minutes, or until the bacon is golden and crisp and the fat has run out. Discard the garlic and take the pan off the heat. While the bacon cooks, finely grate the Parmesan cheese and beat the eggs in a measuring cup with a cup with a fork. Mix half of the Parmesan into the eggs. Season with salt and pepper. When the pasta is just tender, reserve a cup of its cooking water, then drain it in a colander. Add the pasta to the bacon pan, add 2 tablespoons of the reserved cooking water, then pour the egg and cheese mixture over it. Toss everything together quickly (tongs are useful here), so that the egg mixture, bacon and its juices coat the pasta. The residual heat in the pan and the pasta will be enough to just cook the eggs to a creamy sauce within about 1 minute. Scoop the pasta into warmed bowls, then sprinkled with the rest of the cheese and a little black pepper, and serve immediately.